Gateway YWCA is a vibrant focal point to what had been the home of industrial sheds and a power grid. Sited on a former brownfields area once owned by Duke Energy. 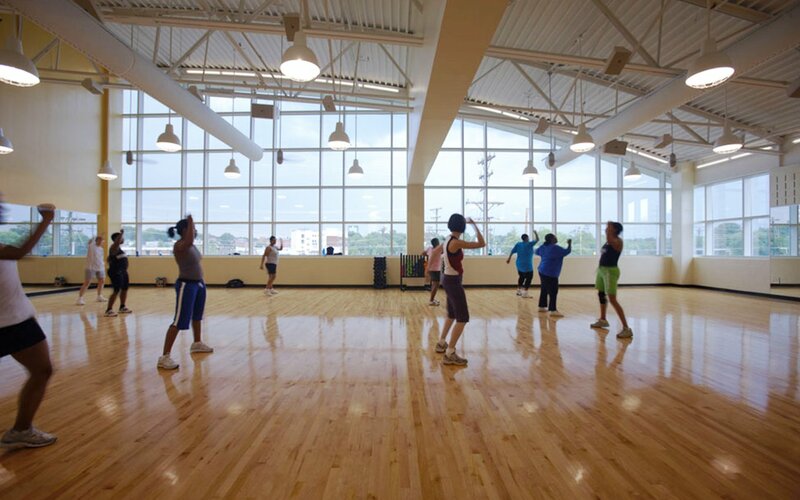 The YWCA provides not only fitness facilities but a gathering place for Winston-Salem’s diverse community. 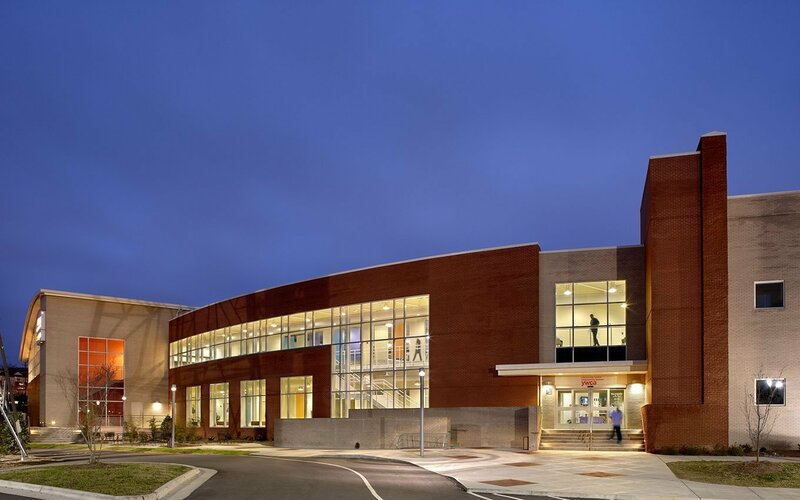 The building includes a 25-meter, 8 lane AAU competition pool, a family pool, 3 AAU basketball courts, adult and youth fitness areas, a running track, game room, computer lab, and locker rooms. 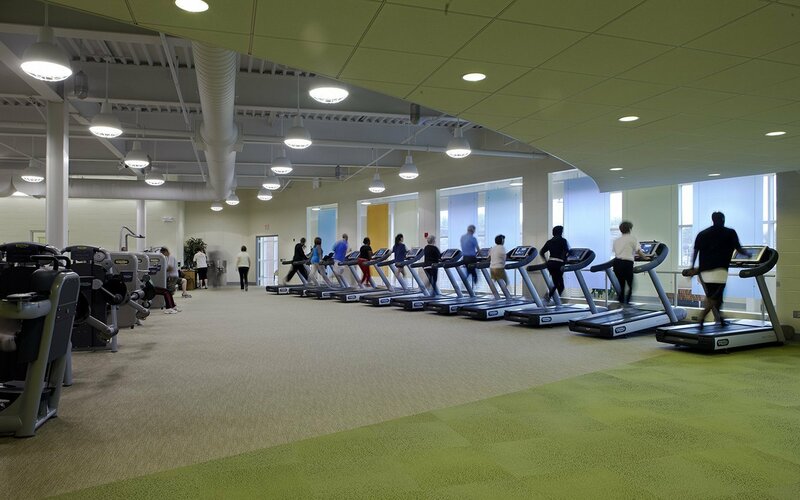 It also houses the WFUSM-YWCA Collaborative (The Collaborative), an innovative collaboration between Wake Forest University School of Medicine and the YWCA that focuses on childhood obesity. The Collaborative staff work directly with the community, providing educational programs about healthy lifestyles as well as hands-on learning programs such as healthy cooking. 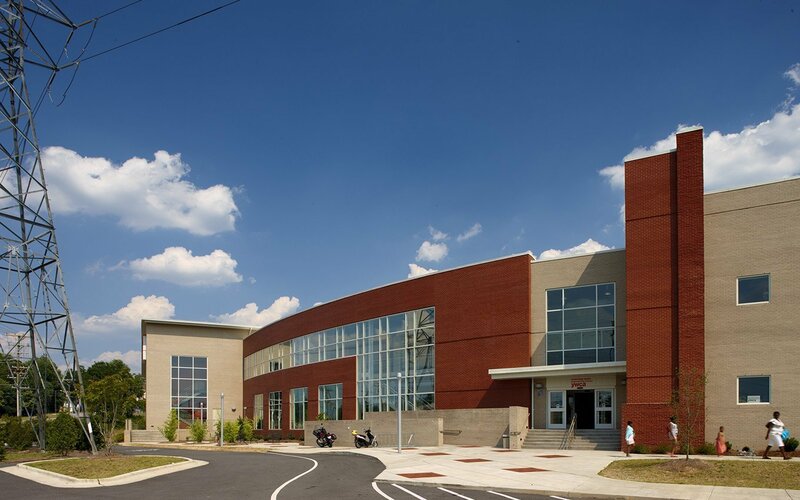 The exterior of the building expresses the vibrancy of the activity within; curved and flat roof forms delineate and break up the building mass. Contrasting brick colors also help demarcate building areas into defined spaces. The north façade is as transparent as possible with large expanses of glass spanning two stories, opening up the atrium and fitness areas to views of downtown Winston-Salem. The client wanted a dynamic, bold lobby to welcome members and guests. YWCA’s brand colors and brand-approved colors welcome members and guest and lead them to the reception and sign in areas. 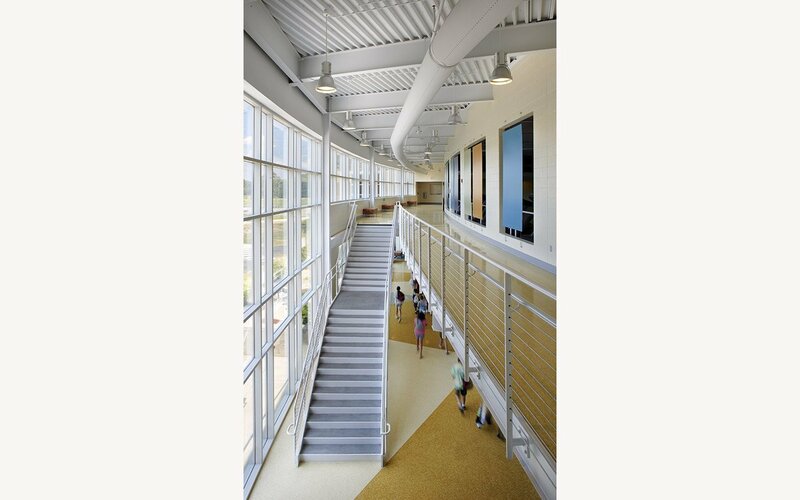 Exposed MEP systems become a design element. 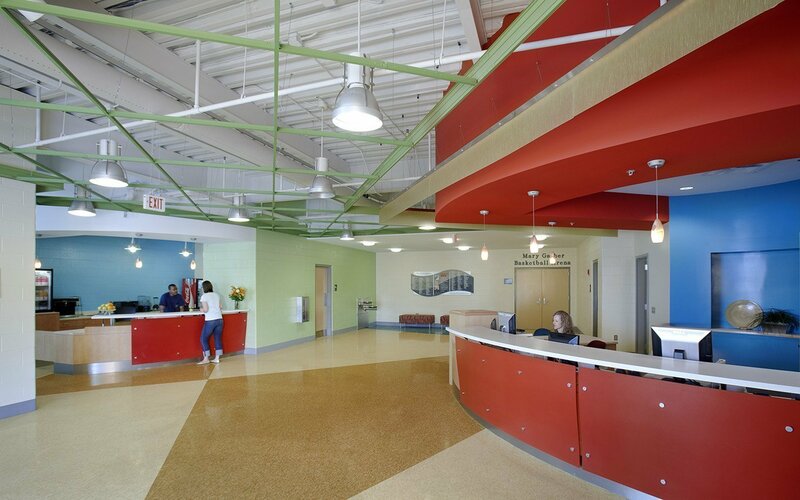 With the client under tight budget constraints, the design team found creative and functional ways to create visual interest that were also cost-effective. 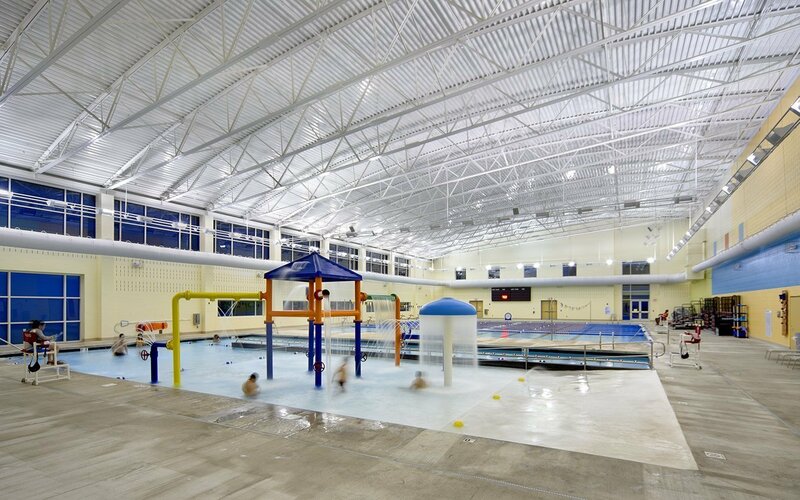 Glazed acoustic masonry in the pool area helps control sound in what is traditionally a loud area; the design team used the variety of colors available in the material to create a color block pattern that enlivens the space. Because the blocks themselves are colored, the pattern is not a maintenance issue or something that has to be repainted every few years. The site challenges were significant – with high-voltage transformer lines that could not be moved, soil contamination and the fact that part of it sits in a floodplain. 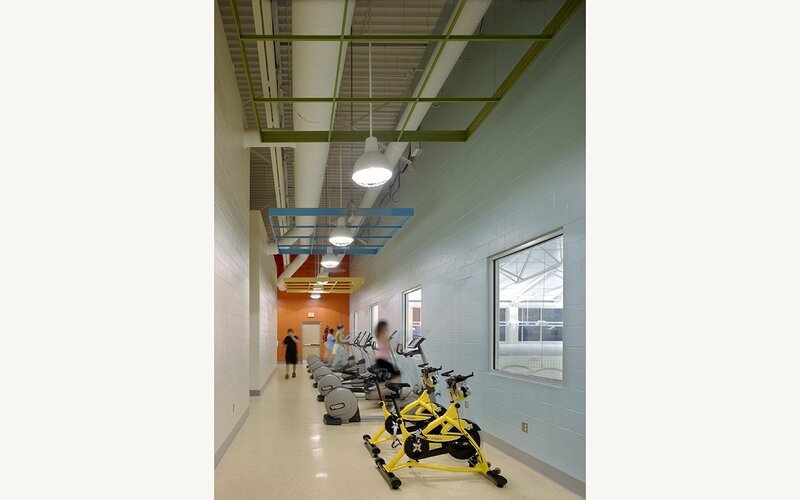 The building was placed very carefully on the site, built to the edge of the existing easements to maximize use of the land and avoid the power lines, yet give the YWCA the space and visibility the building needed. As a result, an area previously seen as unusable is now the site of a beautiful building and landscaping, bringing new life to the neighborhood.